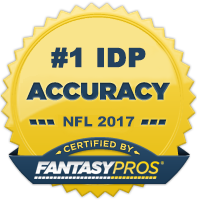 After a two week hiatus, the Guru is back from his European vacation and ready to dish out some IDP advice! Cowboys ILB Sean Lee will undergo season-ending surgery on his big right toe and will miss the remainder of the season. Jon Beason said he's likely going to have season-ending knee surgery early next week and will miss the rest of the season as well. Packers FS Charles Woodson will miss six weeks with a fractured collarbone. London Fletcher is day-to-day with a hamstring injury and is in danger of missing the first game of his 15 year career. Vontaze Burfict had a monster game last week with 15 total tackles (13 solos) and has quickly become the linebacker to own in Cincinnati. He's on bye this week but may be worth using a waiver wire move on regardless as the fantasy linebacker position is getting thinner with each week as the injuries pile up. A.J. Hawk surprisingly left the field in dime packages last week and consequently only played in 38 of the team's 63 snaps. Conversely, Brad Jones played every down, but failed to make an impact in the box scores. Hawk still has really nice value in the right matchups (i.e. against team's who run the ball a lot). However, you have to be careful of when you play him. I wouldn't trust Brad Jones until he shows he can produce in an every down role. Jerrell Freeman continued to play ever down despite the return of Pat Angerer. Angerer split time with Kavell Conner and if I had to guess, I would assume it will be Angerer and Freeman as the every down linebackers moving forward with Conner being the odd man out. Miles Burris take over the every down linebacker duties from Rolando McClain. He had 7 tackles and a sack last week and is worth a look as a LB4+ in 10-12 team leagues. McClain has quickly become waiver wire fodder and is safe to drop in the majority of leagues. Lastly, if you are in to sports betting, check out these sports betting sites. RDE/ROLB Terrell Suggs (BAL) - In amazing fashion, Suggs returned to the playing field last week after suffering a torn Achilles early this off-season. He played over half of the team's defensive snaps and registered a sack against Matt Schaub last week. With so many of the "elite" DEs underperforming right now, Suggs is a must pick up for the majority of fantasy owners. Keep in mind he is on bye this week, however. RDE Ray McDonald (SF) - With only 12 total tackles and 1 sack on the season, McDonald has done close to nothing and isn't likely owned in any fantasy leagues. However, he plays the Cardinals this week and I'm fairly confident I could get a sack against their offensive line. With this said, McDonald is a decent flyer play in deep leagues as a one week pickup, if you are desperate. LDE Brian Robison (MIN) - Up until last week's 3 sack performance, Robison was fairly quiet in terms of fantasy production. However, as Jared Allen continues to improve, teams are once again shifting their focus towards him which is setting up Robison with isolated matchups. You must take his performance with a grain of salt however as he was facing the Cardinals last week and his week 8 opponent (The Tampa Bay Buccaneers) have only given up 9 sacks so far this season. He's a guy to roster in moderate to deeper leagues as a bench player who you can insert as a starter in the right matchups but I wouldn't count on him as an every week starter. LDE Chris Kelsey (BUF) - Kelsay has been a solid, but not spectacular fantasy option during his 10 year career. He's had a sack in each of the last two weeks since taking over for the injured Mark Anderson at LDE. He's a relatively low-risk option as long as he's starting as he plays well against the run and consequently puts up solid tackle numbers. He's on bye this week but is worth keeping an eye as the Bills week 9 opponent, the Texans, have been a top 10 fantasy matchup for DLs this season. SILB Bruce Carter (DAL) - With Sean Lee now done for the year, Carter will takeover the defensive play-calling duties and become the new focal point of the defense. He's not as talented as Lee, but has enough range and play-making ability to be a reliable LB2- for us the rest of the way. He should be one of your first IDP waiver priorities this week. WLB Thomas Davis (CAR) - It looks as though Jon Beason is likely going to have season-ending knee surgery early next week. This is great news for Luke Kuechly owners as he now becomes a clear cut every-down LB1. As far as Thomas Davis and James Anderson are concerned, I expect the Panthers to use a sub-package rotation much like the Lions do with DeAndre Levy and Justin Durant. This will result in an increase in snaps for both players and should elevate them into the LB3+ category. MLB Chase Blackburn (NYG) - Blackburn has played 357 snaps so far this season for the Giants and seems to finally have a grip on nickel package duties. He's not going to set the world on fire for your fantasy team, but in the right matchup he is capable of LB3-LB3+ production. He plays the Cowboys this week who have been a favorable matchup for inside linebackers and is a good bet for 6-8 tackles. SILB Dannell Ellerbe (BAL) - After Ray Lewis was put on IR last week, there was a lot of speculation as to who would be the main benefactor of his injury. With 12 total tackles, Ellerbe established himself as the linebacker to own ahead of Jameel McClain. Ellerbe has been the better linebacker of the two this season and presents the most upside. The Ravens are on bye this week, but make sure Ellerbe is on your radar come week 9 (McClain is a good option as well for those in deeper leagues). ROLB Aldon Smith (SF) - I typically don't recommend pass-rushing, big play linebackers in my waiver wire articles as their production is more difficult to predict on a week-to-week basis. However, Smith plays the Cardinals this week who have been absolutely atrocious at protecting the QB this season. There's a very good chance Smith has a double sack game this week and is worth a LB3 start in balanced leagues and a LB1 start in big play leagues. LCB Tracy Porter (DEN) - Per usual, the Saints have been a fantastic matchup for cornerbacks so far this season. Porter hasn't done much since a big week 1, but he's been banged up and missed the last couple of weeks due to injury. He looks like he's ready to return this week in Denver's matchup against New Orleans and should see plenty of tackle opportunity. Sneaky play in CB-required leagues. SS M.D. Jennings (GB) - Jennings is the best bet to take over at strong safety for the Packers while Pro Bowler Charles Woodson recovers from a broken collarbone. I don't expect him to be nearly the fantasy player that Woodson was, however with several significant injuries to the defense, more teams are going to get to the second level against the Packers which should lead to more tackle opportunities for the cornerbacks and safeties. Additionally, I would expect the Packers to play Jennings closer to the line of scrimmage in an attempt to help out a beleaguered linebacking crew. DB4+ right now. SS Mike Adams (DEN) - Adams has been quite solid in the tackle department for the Broncos over the last two games (19 total tackles) and has a great matchup against the Saints. If you are looking for a high floor, DB3 option in 12 team leagues this week, Adams is a good choice. SS Glover Quin (HOU) - Quin has struggled to rack up tackles playing behind a strong front seven during his career in Houston. However, the departure of DeMeco Ryans to Philadelphia and the season-ending injury to Brian Cushing has left more scraps for the 4th year player out of New Mexico. He's registered 5 or more solo tackles in 4 consecutive games and has a string of good matchups coming out of his week 8 bye. He's worth a look as a DB3 in balanced and tackle-heavy leagues.